Tatiana Tarasova commenting the World Championships mentioned that Peter Tchernyshev will work on new dances with Alexandra Stepanova / Ivan Bukin. Before it were only rumours and predictions, but now it’s an official information. Peter choreographed a free dance for Stepanova / Bukin. We have worked with guys for over three weeks. Already have done a huge step and, in general, almost 99 percent of the material is ready. We can say that the “skeleton and meat” of the program is ready, it remains only to dress up a bit our joint creation. 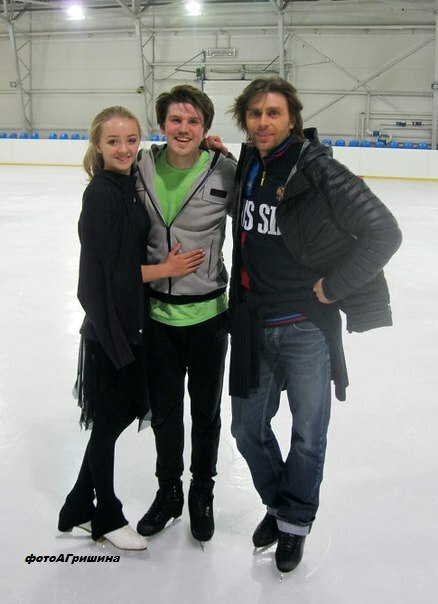 It seems to me, that in ice dance aesthetics is the most important, and guys have it. Stepanova and Bukin are gifted physically athletes and gifted in movements, with a good technical base. I think they have a full package of necessary features in order to be successful athletes in ice dancing and compete at the highest level in the world. I wouldn’t say that it’s an experiment for me. Ice dance is a familiar discipline for me. Last year, I worked with Americans and Canadians, made two free dance. – Tchernyshev told. Last season dances made by Peter for Maia/Alex, Kaitlyn/Andrew were quite in the same style. I liked both, can’t say that this style will 100% suit Alexandra and Ivan, but why not to try? It won’t be worse anyway. But I’m quite surprised that noone asked Tchernyshev to do a short dance – I think he could choreograph a great blues! Russian ice dance as always will be dramatic) So, I’m excited to see the result of this colaboration, will Stepanova Bukin be able to keep their spot in the Russian team? At least they’re trying to do something new. Sergei Voronov: I earn my place on the ice by my own work.